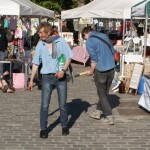 Some of you may remember the Grassmarket Music Festival just over two years ago which was meant to be a trial run for something much larger given Edinburgh Council had claimed to have put in enough power for a U2 concert when they had pedestrianised the Grassmarket. However this was part of the BID (Business Improvement District) application and that was delayed a year. That went through in February and they are now ready for that U2 concert or something similar this September. More news to follow. Our Mark E Smith lookalike may return but this time he will need a ticket !